An activity is a specific action that the blessTags application will execute when a specific event will take place. Here we have two key concepts: event and action. Events are things that happen within your blessTags app. environment at which you might want to take a specific action. 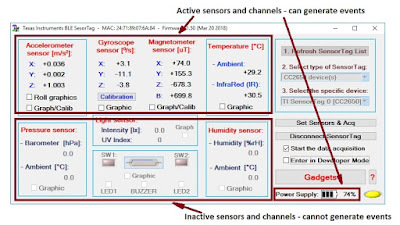 An event is triggered from a specific value (a numerical value presented in black color on the blessTags user interface) obtained from an active sensor placed inside a SensorTag. 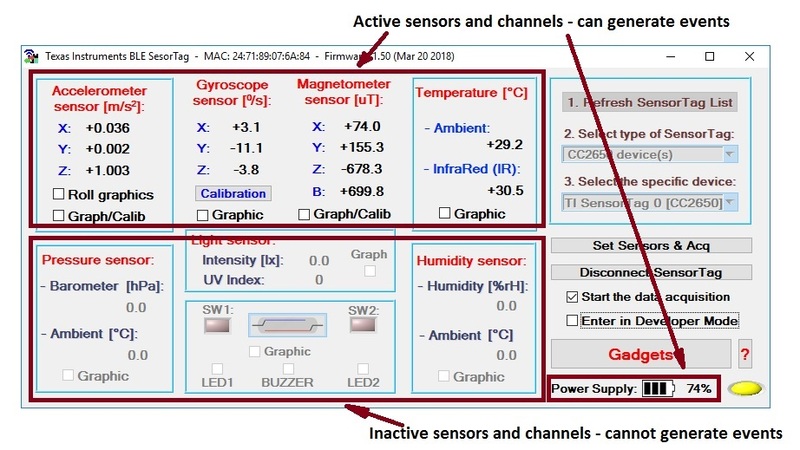 The values types able to generate events are the instantaneous value, the mean value or the variance value of the data flow from a specific sensor or a specific channel from a specific sensor (e.g. channel Z of the gyroscopic sensor). If the desired value (instantaneous, mean or the variance) is lower or higher than a threshold value or is inside or outside of a specific range of values an event will be generated. After an event has taken place, an action will be executed. 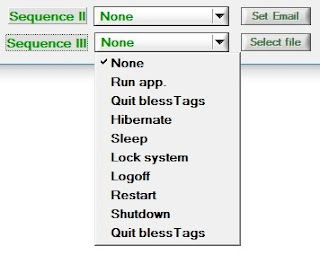 At this moment, on blessTags app., several actions are implemented: run an application selected by the user, send an email, quit the blessTags application, lock, hibernate, sleep, logoff or shutdown the system (the device on which the blessTags application is running). In the video presented below, I will show you this new product feature (starting from 11.0.0.0 version) of the blessTags application: activities. The blessTags application can send emails when a specific event occurs. However, in order for this feature to work properly, we need to configure correctly the mail engine of the blessTags. To do this, a special panel was developed – see below. In the upper part of the panel are placed the SMTP (Simple Mail Transfer Protocol) server settings. The SMTP server is the server that will take care of the delivery of your emails. Here you have 2 edit boxes (Host and Port) and one ring control (Security type) to set the SMTP server. The Host is the DNS name of your SMTP server - you can find it consulting the web page of your provider. The Port is the endpoint of your computer connection – different number are associated with different types of protocols. 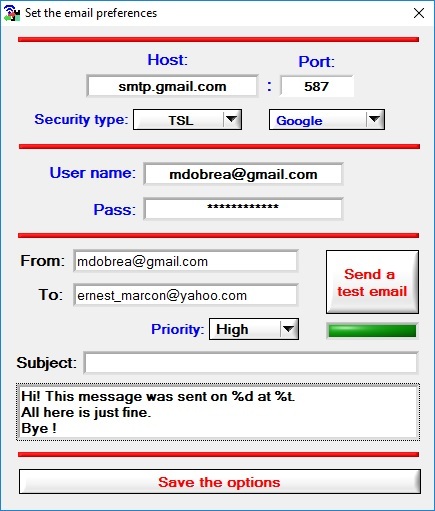 The default SMTP port (default transmission channel for internet email) is 25. The mail engine of the blessTags application support SSL connection on 465 (25025) port or TLS connection on 587 (2525 - it is an alternate port, which mirrors port 587 and also supports TLS encryption) port. In any case, the email provider may decide to use a custom port to establish the connection – in such case please consults the web information of your provider. The security type ring control allows you to configure the encryption of your transfer: no encryption or to use an encrypted communication like STARTTLS or SSL/TLS. 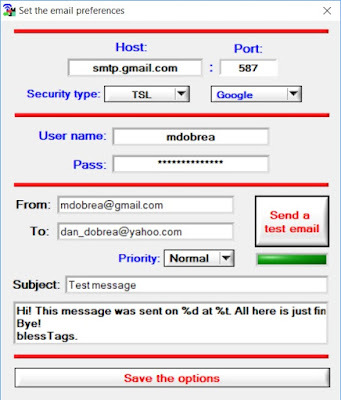 You can manually enter the SMTP settings for your server or you can use the fourth ring control that encapsulates SMTP server settings for nine of the commonly used email services: Google (Gmail), Microsoft (Outlook/Hotmail), Yahoo (Yahoo! Mail), Zoho, AOL (AOL Mail), GMX, Lycos, Yandex, and mail.com. 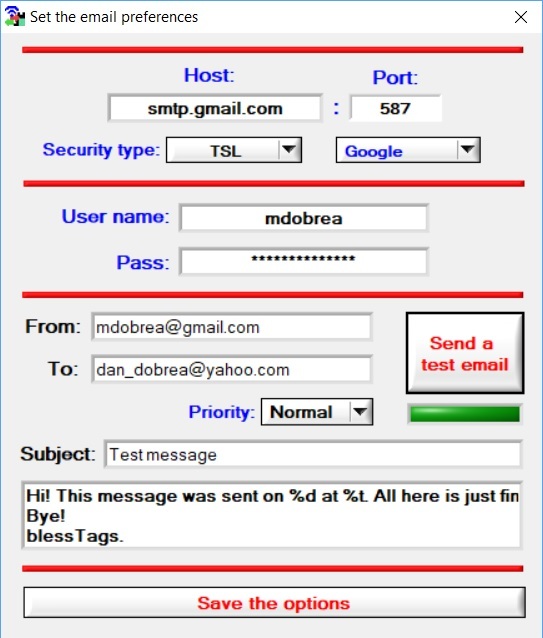 All the setting information, for these SMTP servers, were collected from the official sources (namely, the official websites of these company) and were tested previously. But you may consider that the email service provider may change its mail server settings without any prior notification. I suggested you to contact your email service provider in case you encounter any error during the account setup. In the following fields, you must enter the username and the password. These information are specific for each mail server. A bit lower you must enter the email addresses, select the priority of your email, the email’s subject and the body of your email. All these fields are constrained to 60 chars, apart from email’s body which is limited to 90 characters. The test button lets you send an email when you click on it. If this email arrives well, then it means that everything is set up correctly and when an event will occur the email that will be sent will certainly arrive also. In this panel as long as your blessTags application sends a message, the LED will be red and the “Send a test email” button disabled. A very nice feature specific to the mail engine of the blessTags is that you can include two types of specific strings (in the body text of your email) that will be replaced by the date (%d) and by the time (%t) of the device on which the blessTags application is running. A small problem that may occur from time to time is that some email providers accept the user's name in the username field, while others want the full email address. 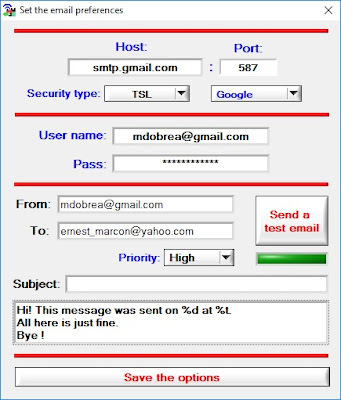 For example, the Gmail email provider accepts mdobrea or mdobrea@gmai.com as a username, while others, like GMX, accepts only mdobrea@gmx.com as a username. The entire configuration process if the mail engine of the blessTags is presented in the following movie.